When changing your diet to make old favourites more healthy often small changes go a long way to make them higher in fibre and lower in carbs. For this dish cauliflower was an obvious choice in vegetable. It is low in fat and carbs and gives you the extra benefit of potassium (176.1 mg of potassium in just one cup). 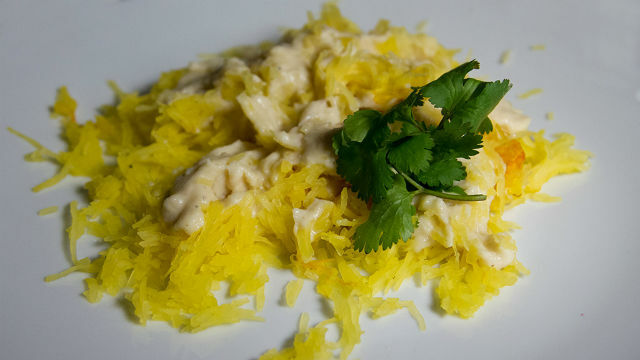 You can choose to go the route of enriched pasta fettuccine or as shown in the photo substitute spaghetti squash instead of pasta. If you want to add meat try adding shredded left over chicken breast. The sauce can be used in so many other ways. Try it on baked potatoes with some broccoli, lasagna, potato au gratin or even as a warm dip. While the cauliflower is cooking, heat a large frying pan and saute the onion and garlic with the butter and olive oil until soft. When both are done, using a slotted spoon, remove all the cauliflower from the broth and place in a blender or food processor. Add 1 cup of the cooking broth, all the contents of the frying pan, the nutmeg and salt. Puree on high until very smooth, 3-4 minutes. Add a little more broth at a time if it needs to be thinned. Serve with baked spaghetti squash separating strands by running a fork through in the "from stem to stern" direction and serve warm.